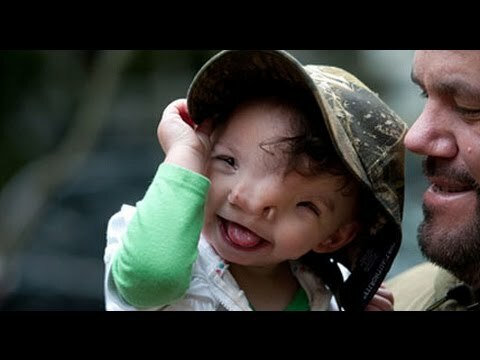 Violet Pietrok was born nearly two years ago without a nose. Her eyes were set so far apart that her mom compared her vision to a bird of prey’s. There was a gap in the skull behind her forehead. There was no question she would need drastic surgery to lead a normal life. But few surgeons have seen patients with problems as complex as Violet’s. Her parents, Alicia Taylor and Matt Pietrok, who live near Salem, Oregon, brought her to Boston Children’s Hospital, to Dr. John Meara, who had operated before on kids with Tessier facial clefts. As part of Children’s Pediatric Simulator Program, Meara was able to get several 3D printed models made of Violet’s skull. By handling and slicing up the models, he got a better sense of what had gone wrong and how best to fix it. Such 3D-printing is becoming more commonplace in complex surgeries, allowing doctors views and knowledge they can’t get on their screens. 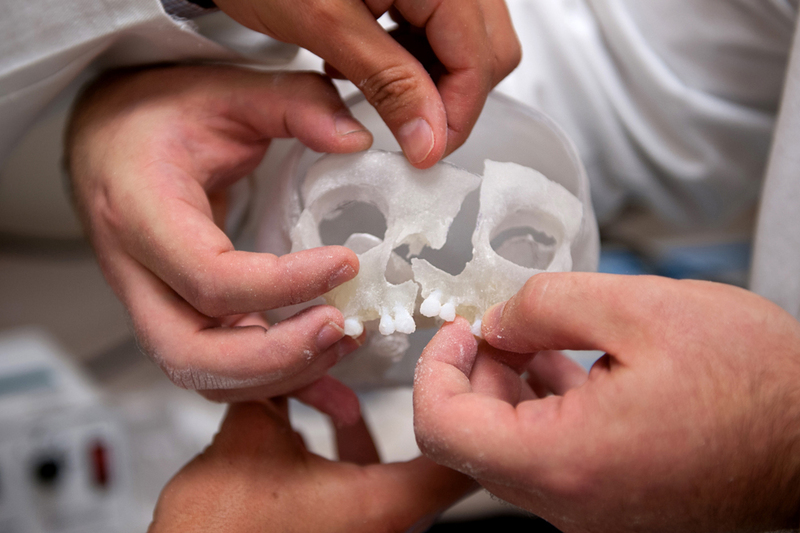 Such 3-D-printed models are transforming medical care, giving surgeons new perspectives and opportunities to practice, and patients and their families a deeper understanding of complex procedures. Hospitals are also printing training tools and personalized surgical equipment. Someday, doctors hope to print replacement body parts. 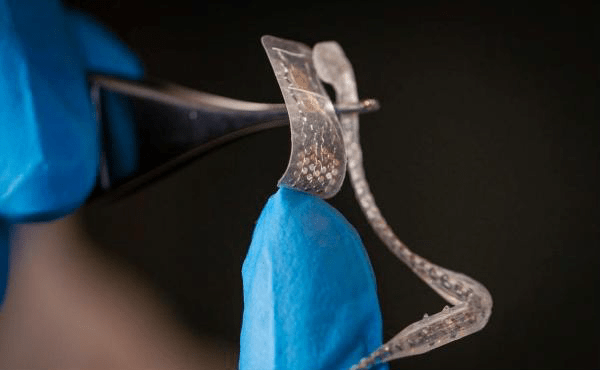 “There’s no doubt that 3-D printing is going to be disruptive medicine,” said Dr. Frank J. Rybicki, chief of medical imaging at the Ottawa Hospital and chairman and professor of radiology at the University of Ottawa. He is the former director of the applied imaging science lab at Brigham and Women’s Hospital, a few blocks from Boston Children’s. For now, the printer extrudes a layer of liquid plastic instead of ink. It adds a second layer, and then another, and a skull or rib cage — or whatever the surgeon dials up — slowly emerges. The same process can also print layers of human cells. 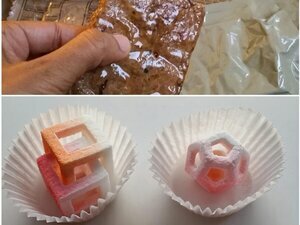 So far, researchers have also printed blood vessels, simple organs and bits of bone. From Lamps shaped like Mushroom Clouds to a rendition of Michelangelo’s ‘David’ with Flowers, Feast Your Eyes on this list of the Top Ten 3D Printed Art! Mushroom chairs, nuclear cloud lamps, eerie ghost-like trapped creatures, beautiful shell-cone objects, and stag’s and futuristic human heads, are all featured as some of the coolest pieces of 3D printed art we’ve seen yet. 3D printed art has unique details, with 3D printing allowing for the kind of subtlety and nuance of detail that requires much less handicraft time than conventional sculpture. This list represents a range of styles, textures, and functions; some beautiful and organic, other witty or humorous, and yet others introspective, eerie, and even unnerving. Enjoy! 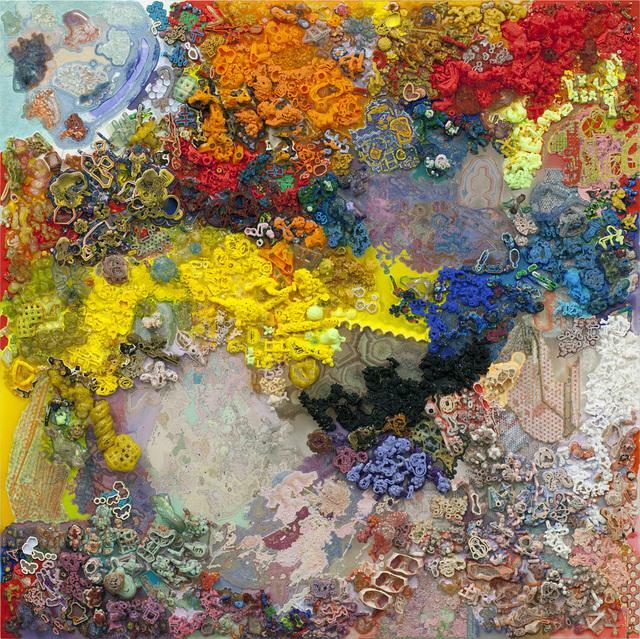 In Shane Hope’s piece, he combines nano-structural, or small scale structural, reliefs that are first 3D printed and then painted to “reconcile the parts seamlessly.” From a great distance the work, “Public Panopticon Powder,” looks almost like an Impressionist painting, but up close it resembles barnacle pieces of coral reef. The work is part of his series “Species-Tool-Being”; the rest of the series can be found here. 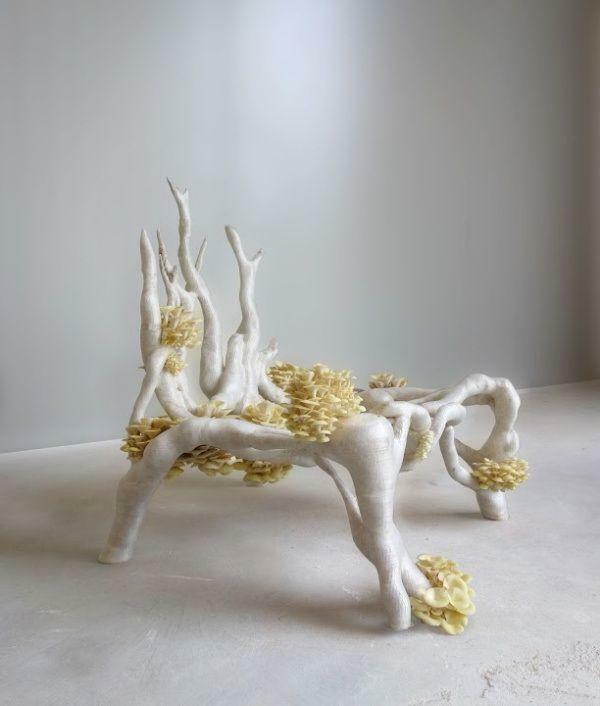 Not only is Eric Klarenbeek’s “Mycelium Chair” also inspired by organic elements — it features mushrooms. In this piece that looks like something you may find in the same magical other world where Nuala O’Donovan’s (see above, “Teasel Grey Fault Line”) work resides. Maybe not so comfortable to sit in, Klarenbeek‘s chair shows how 3D printing can use natural elements to enhance the message of a work. While there’s some incredibly unique 3D printed art, there’s also some more knock off work that this next series seems to epitomize. Recognize this sculpture? It’s Michelangelo’s “David” reworked in a 3D Printed Cat sponsored series entitled “7 Davids,” by designer Valeriya Promokhova. This piece is done “in Flowers,” and the series also includes printings in spirals, splines, curves, and other designs. 3D printing is allowing people to create images and objects that may have been previously difficult to capture. In this case, this Beijing artist creates haunting and sometimes terrifying works by layering glass panes to create a three dimensional effect. Some of his work looks like people are drowning or trying to escape another dimension — as this one does. Others can be described as ghost-apocalyptic, as the subjects represented appear to have endured harrowing events. This is certainly some of the more thoughtful 3D printed work out there. If the previous piece seems eerily post-apocalyptic, this one is definitely mid-apocalyptic. Nothing says “end of the world” better than this 3D printed nuclear lamp cloud designed by Veneridesign Studio. 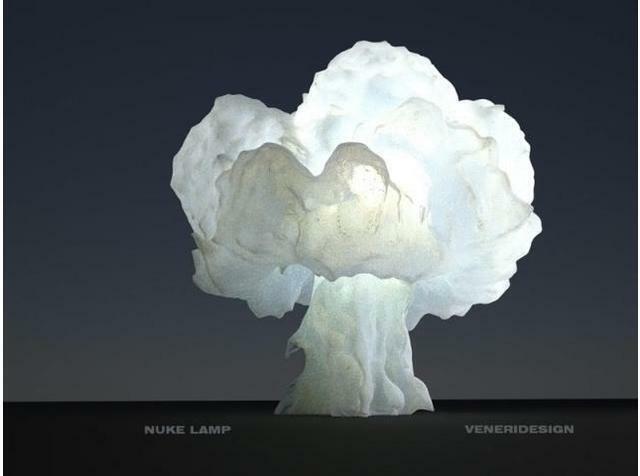 Over the years, we have seen so many different versions of the mushroom cloud: why not make it functional by using it as a lamp? 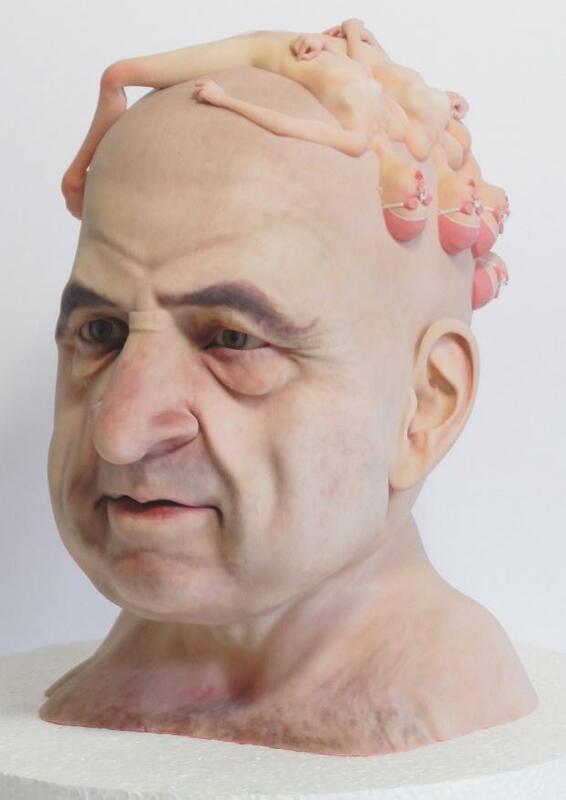 For some reason, heads and busts are big in 3D printed art, and the first one we feature here in our series of 3D printed head art is really surreal and kind of unnerving. The next artist, Eric van Straaten, describes his work as embodying “weirdly eroticized corporeality”: and weird is right. Young nudish swimmers laying on top of an older man’s head, forming a makeshift swim cap, can only be interpreted as a clash between youth and age, revealed in the focus on the physical aging of the man’s body. What’s important to note is how the materials used mimic real skin. 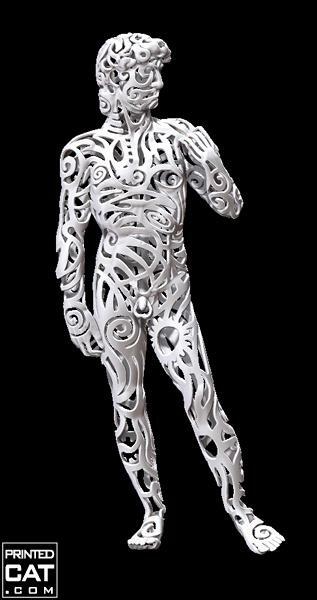 This 3D printed sculpture is definitely over most of our heads! This last piece is a wheel made up of skeleton legs that has a very pretty appearance from afar, but on closer inspection it presents a macabre, yet still thoughtful, feel. 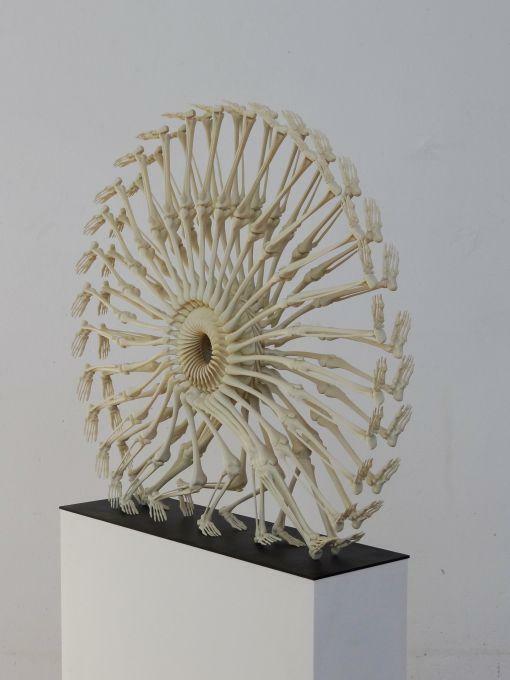 Done as 3D print artist Monika Horčicová’s Bachelor’s Thesis, “The Wheel of Life” reminds us that the future of 3D art is in good hands, and life is too short not to enjoy some of it today. What do you think about these pieces? Let us know your favorite — of these, or all time! — piece of 3D printed artwork over in the 3D Printed Art forum thread at 3DPB.com. The recovery of vision thanks to 3D printing! 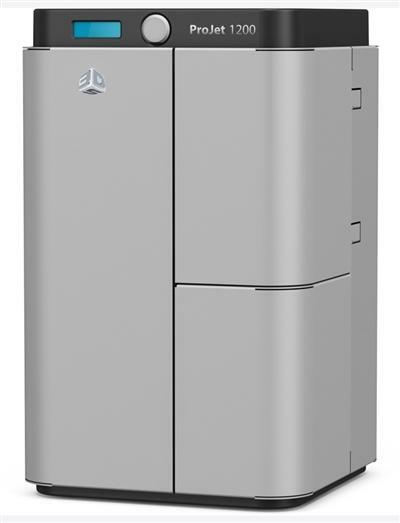 3D Printing is such an amazing technology. I can’t emphasize it enough. Each and every day I am surprised by the ways in which this technology is being used. As a journalist covering 3D printing news on a daily basis, there are days when I get goosebumps on my arms just writing a story, while other days I am presented with material that can be quite humorous. One thing is for sure though; I never have a boring day. Today, in preparation for covering this particular story, I actually had tears come to my eyes; the very eyes, that thanks to my contact lenses, have nearly 20/20 vision, and the very eyes that many of us take for granted. Unfortunately, not everyone can see with clarity. There are those who have lost their eyesight almost completely due to macular degeneration, retinitis pigmentosa, or some other condition or events. These people only wish that they could one day see again. Thanks to researchers at the Bionics Institute, 3D Systems’ ProJet 1200 3D printers and a company called evok3d, some of these people may one day get their vision back . 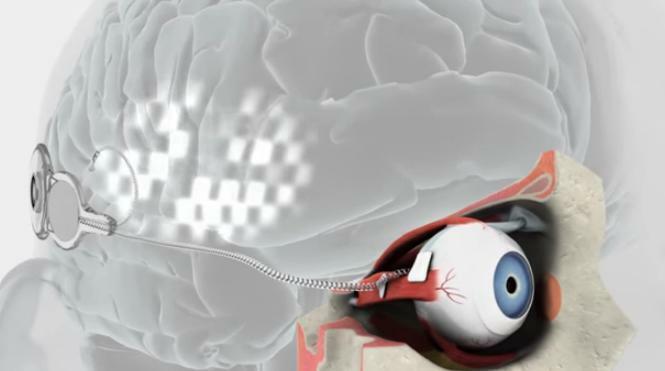 Researchers have been working for several years on what they call a ‘bionic eye’, which aims to provide new vision to those suffering from retinitis pigmentosa and age-related macular degeneration. In order for a patient to see results from this device, which remains in its testing stages, they will need to still have some remaining retinal ganglion cells, a healthy optic nerve and visual cortex, and they must at one point in their lives have had the ability to see. 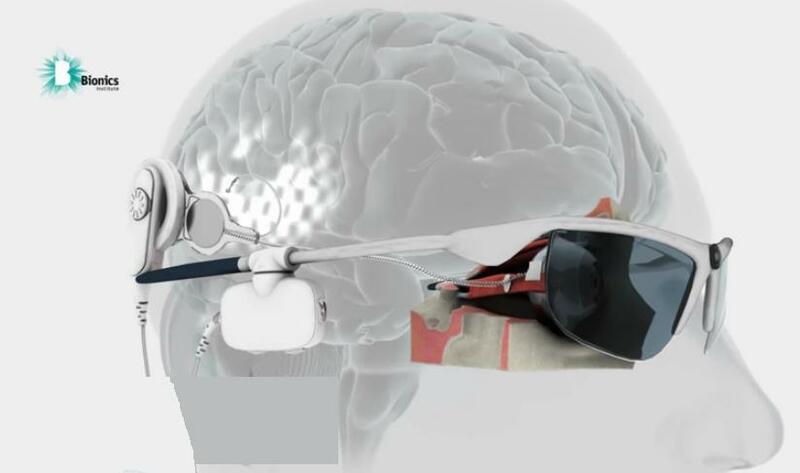 The bionic eye has already been tested on a select few individuals and it has been shown to work. It is able to provide enhanced vision to those experiencing both partial and total vision loss. In order to generate the prototypes for these bionic eyes, as well as the molds used to create the silicon version, the Bionics Institute has been utilizing a ProJet 1200 3D printer, with help from evok3d, which specializes in 3D printing, scanning, and advanced additive manufacturing technology. Associate Professor and Senior Research Fellow at the Bionics Institute Chris Williams has been tasked with using the ProJet 1200 printer in order to create verification models which are used to test for functionality, fit, and size. They also use the printers to create pre-production molds from the models which they use to cast silicon prototypes. These bionic eyes have been researched and worked on for 10 years now, and just recently, thanks to the precision and efficiency of 3D printing technology, the first clinical trials have been completed. The bionic vision system includes a camera which transmits radio signals to a microchip in the back of the eye. These signals are then converted into electrical impulses, which are able to stimulate cells in the retina and connect to the optic nerve. They are then transferred to the vision processing areas of the brain, where they can be interpreted as an image which the patient can see. With the current prototypes, patients don’t exactly see the same way that we do. Instead they see blob-like shapes and lights, but the technology has proven to work in allowing blind individuals to walk around unassisted. While the technology still has a ways to go before we see it hit mainstream use, there is an extraordinary amount of hope for those who have unfortunately lost their eyesight, thanks to the Bionic Institute, those individuals involved in the project, 3D printing, and evok3d. “It was quite promising, their vision was optimized, obviously they want better vision and fully wireless power, but the eye surgeons were pleased with the process and that’s a platform for future trials,” Williams said. What do you think about this incredible use of 3D printing to fabricate working prototypes for the creation of bionic eyes? Discuss in the 3D printed bionic eye forum thread on 3DPB.com.